Education should enlighten young minds, empower them to fulfil their dreams, Academic and Core Curriculum help them rationalize and nourish their souls. At The HDFC School, we seek to nurture a new generation of thinkers who are confident, inventive and well - balanced. It is widely believed that learning comes to each child in his/her own unique way. We believe that creative spaces for exploration, inquiry and expression are indispensable. To foster new learning, the students are encouraged to reflect on the engaging experiences: what happened, how it happened and why it happened. The school curriculum is ingeniously designed to enhance creativity, collaboration, communication skills and team ethics. Our subjects do not exist in isolation, nor does our learning. Field- trips, excursions, movies, workshops, projects, meeting authors and experts from different fields constitute our academic framework. Our competent, experienced and progressive facilitators assist and guide the students in their journeys to explore the world both within and outside. The school adopts a constructive approach and pedagogy with project based learning and hands-on experience as its areas of prime focus. Integrated, collaborative and interactive approach help the students to apply their knowledge in real-life situations and contribute to their holistic development. The students learn to critically evaluate, analyze and express themselves. Emphasis is placed on learning by asking questions, problem solving and through application. The curriculum includes programmes to develop scholastic and broader skills to complement each other. The overall environment is conducive to fostering Academic Excellence and Creative Brilliance. The transaction of the curriculum is designed with a ‘child-centric’ pedagogy i.e. giving primacy to children’s experiences and their voices. Project based learning and integrated projects enhance their critical thinking and collaborative skills. 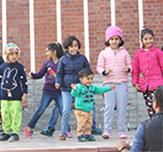 Experiential learning being the core, the school uses play based activities to enhance the learning abilities of children. Through these hands-on experiences, teachers enable the students to learn new and advanced concepts, thereby deepening their overall understanding. It is an established fact that the learning curve of children and their abilities to grasp new and advanced concepts get enhanced through use of activities like dramatic play, art, and social games. That is why we use 'Learning Through Play' as a methodology in our Nursery and Kindergarten classes. In the field of Early Childhood Education, there are several approaches for the curriculum. We, at The HDFC School, have drawn upon the finest elements from these approaches to develop the best curriculum for the holistic development of your children. It is our view that the first two years of your child's school life is the ideal opportunity to mould their 'sense of self'. We follow a non-formal, yet structured approach to learning with a focus on family, home, culture and language. Here, children are encouraged to explore the environment around them, through projects that integrate Art, Craft, Technology, Music and Dance. Besides, our activities are designed such, to develop each child's Fine Motor Skills and encourage Sensory Development. 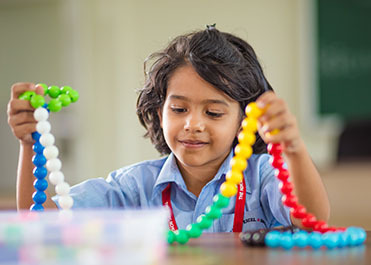 The HDFC School builds on the spirit of exploration during the Primary School Years using a teaching-learning process that is collaborative and based on discovery.Emphasis is placed on acquiring language skills, clarity of mathematical concepts, the discovery and understanding of scientific principles and an awareness and appreciation of diversity of India and world’s history and culture. Project Work in Primary School Years enables learners to build on knowledge from a variety of sources and acquire good habits of learning. Evaluations and Assessments are continuous and ongoing in the form of oral and written exams conducted periodically along with show and tell activities and projects. All CBSE norms and guidelines are followed in terms of assessments and evaluations. With a well-balanced mix of focus on scholastic and non-scholastic areas, the children in the Primary School Years as compared to the secondary years spend more time on subjects such as visual arts, performing arts and sports. 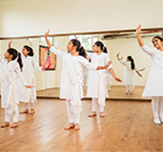 At The HDFC School, we ensure that while there is a balanced blend of Academics, Arts and Physical Education, there is also interdisciplinary integration. For e.g. 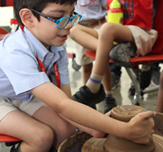 while learning about volcanoes in the science class, children also make clay models or paintings of volcanoes in their visual arts class. The Middle School Years at The HDFC School are enriched by teacher-designed worksheets and subject integrated projects. Emphasis is placed on learning by asking questions, problem solving and through application. The curriculum includes programmes to develop scholastic and broader skills alongside each other. There are significant opportunities for expression through communication activities (debates, public speaking and drama), performing arts, physical education, visual art and craft, environmental studies and information technology. The detailing of History and Geography as separate subjects, science diversifying into Physics, Chemistry and Biology and the introduction of a third language --all with the excitement of examinations bring a transition for the students. Therefore, at The HDFC School, we take special care that our learners are regularly guided and counselled through these transitional years. In the Middle School, assessment and evaluation will be done based on policies and guidelines laid down by CBSE. The scheme of learning in the Secondary School draws from the requirements of the CBSE syllabus. For the purpose of fostering core competences in learners, the curriculum encompasses six major learning areas, which are: Languages, Humanities, Mathematics, Science and Technology, Health and Physical Education, Visual Arts and Performing Arts. These learning areas are integrated with each other in terms of knowledge, skills, comprehension, values and attitudes Our students are encouraged to recognize and appreciate the interconnectedness of all knowledge and the enduring connection between knowledge and values. A fine balance of academic rigor, proactive use of information technology, inquiry based learning and individualized support for our learners is the key to prepare our learners for the Senior Secondary years. Our team of highly experienced educators ensures that the core strength of each learner is honed and highlighted, resulting in confident and well-rounded personalities who are ready to set the sails of their future towards careers of their choice. 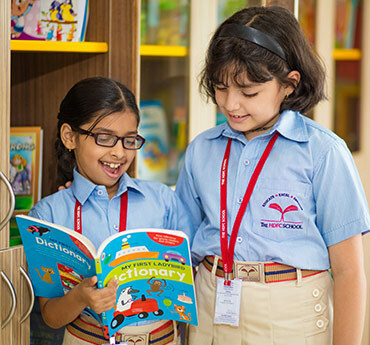 The HDFC School believes in a holistic approach to the curriculum, rather than merely focusing on Wider Curriculum rote-learning and text-book knowledge. The focus is on central concepts and principles, problem-solving and finding innovative solutions. Students will be encouraged how to think rather than what to think. Our programs have integrated the latest technology into the curriculum. Our co-scholastic program is in line with our philosophy - ‘Academics comes first’. We combine this philosophy with the belief that a diverse exposure with activities that will lead to the effective and all-round development of our students. These activities form a vital part of our entire learning process. Performing Arts, Visual Arts, Theatre, Pottery, Engineering Lab, Debate, Declamation and Creative Writing are some of the important activities that are a vital part of our broad based co-scholastic curriculum. This curriculum refines the creative, scientific, literary and organization skills of the students. This results in better performance in inter-disciplinary activities, cognitive development, well-rounded personal development and an attitude of sustainability. The curriculum has been designed keeping in mind a ‘child-centric’ pedagogy i.e. focusing on children’s experiences and their voices. In this light, project based learning enhance their critical thinking and collaborative skills. Experiential learning being the core, the school uses play-based activities to enhance the learning abilities of children. Through these hands-on experiences, teachers enable the students to learn new and advanced concepts, thereby deepening their overall understanding. Our co-scholastic programme is in line with our philosophy – ‘Academics comes first’. At the same time, we believe that a diversified exposure will lead to an effective and all-round development of our students. These activities promise to be an integral part of the learning process, enhancing self-expression and creativity in our students. Visual Arts, Theatre, Performing Arts, Pottery, Engineering Lab, Debate and Declamation, Creative Writing form an important part of our broad based co-scholastic curriculum. The co-scholastic curriculum refines the literary, creative, scientific and organization skills of the students. This results in better performance in inter-disciplinary activities, cognitive development, well-rounded personal development and an attitude of sustainability. Our Co-scholastic activities provide students with a different setting to develop and 'seek out excellence'. These outside-the-classroom activities cultivate in students positive qualities of leadership, teamwork and responsibility and at the same time give them enjoyment and a sense of purpose. Becoming socially conscious to human values, we give them the opportunity to interact with the community to learn and get hands-on experience about social issues. We involve our students in community welfare activities from a young age and as they graduate to higher classes (Secondary & Senior Secondary School), we gradually expose them to more impactful and real social issues. In order to achieve this we have begun creating a Structured Community Service Programme. It is our endeavour to guide our students to reach out and contribute to society at large through our active welfare programmes. As a parent you are an important part of The HDFC School community. Apart from the regular reports on student achievement and progress that you will receive, we also have a comprehensive Parent-School Programme so that you can participate and be involved in the growth and development of your child.